-Wash & devein prawns, clean the prawns by rubbing lemon and salt.Leave aside for 10-15 minutes.Wash under running water and drain,keep aside. -Rub the powders and set aside for 1/2 -1 hour. -Heat oil in a wok and fry the onions till lightly browned. -Add the curry leaves and salt. -Add the chopped tomatoes and cook till mushy and soft. -Add the prawns and keep stirring on high heat and wait till it changes color. -Add 1-2 tbsp of water and continue to stir fry. -Then,cover the lid & cook for another 7 minutes on medium-high heat. -Uncover the lid,add the soy sauce and the black pepper powder as mentioned in masala. -Adjust salt,dry it up and serve hot with chapathis or rice!! * I have used fresh prawns here,you can use frozen ones. * You can add or omit the last pepper powder in masala.This is moderately spicy version,if you feel to reduce the spices then omit the last part of pepper powder. * If you don't like the cumin flavor,you may omit or reduce it too. * If you wish to omit the soy sauce,then feel free to do so.Adjust the salt accordingly and also dry it up on high flame so that the fry becomes brownish in color. 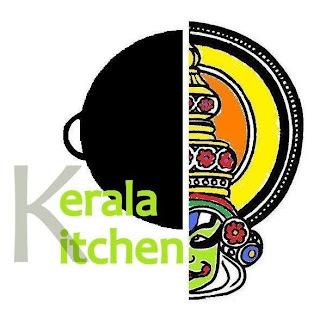 That is an alltime family Kerala favorite of ours:) As usual, all ur dishes make me drool !! Very tempting shrimps with peppery spiced up. Nice colour too. Julie! 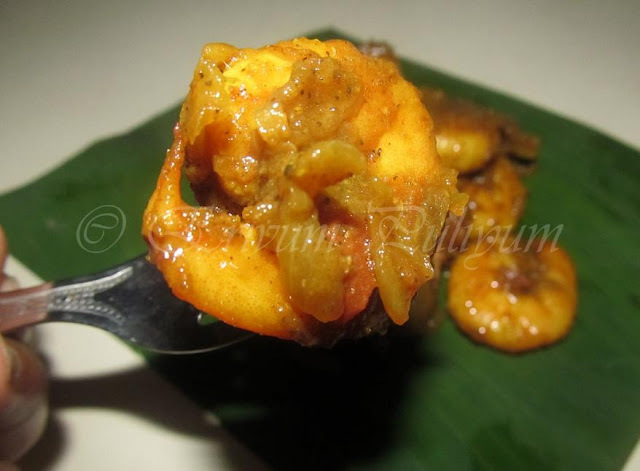 I love prawn so much and this dishes ...deserve to be served with hot rice...mmmmmm delicious! 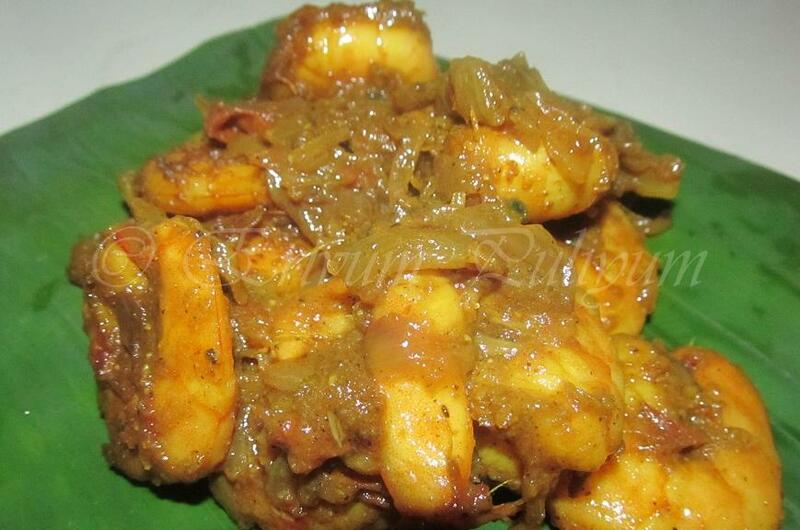 These looks delicious, my all time favourite prawn dish! pepper gives additional taste to prawns.. very delicious..
Love aroma of black pepper; must be a winning combination in company with prawns! Hmm, sound so delicious, need more rice to go with this. Simply love this fingerlicking prawn fry. Looks super delicious, wish i could have some with some roti :). 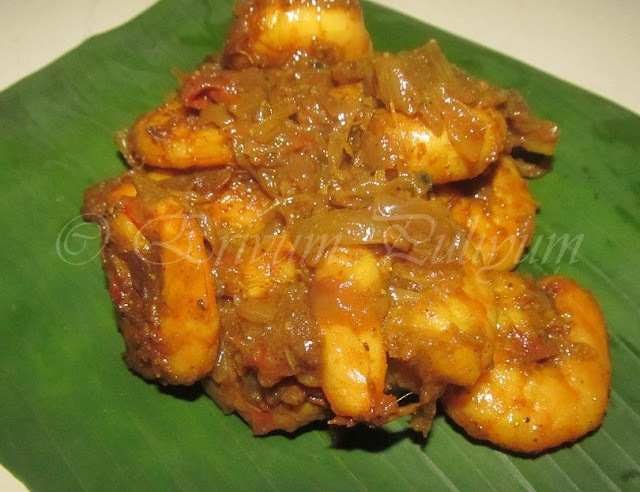 yummy hot prawn recipe ...delicious side dish with hot chapathis! hmmm..that's exotic Julie..Send me some. julie.. taht last pic had me.. i wish i cid just tak ethat spoon into my mouth!!! lovely.. Drooling!! Looks so delicious and tempting! I love shrimps and these marinated ones are just perfect!